The University of Arizona ranking is 60th in the USA and 76th in the world in the University Ranks, and 119th nationally by the USnews. It is ranked as the 250th best college in USA by Forbes. The University of Arizona tuition fees are $10,391 for in-state and $27,073 for out of state students. It is a moderately selective college taking in 77% of applicants. Financial aid offered totals over $208 million per year, an average of $12,600 per student. Requirements for SATs (25th-75th percentile) are Math 490 – 620, and Reading 480 – 610. The total composite is 985 to 1230. The requirements for ACT (25th-75th percentile) are Composite 21 – 27. The University of Arizona is a research university that enrolls students for undergraduate, graduate and professional courses on its four campuses. The courses offered are international in scope with its scholars having an intellectual and cultural diversity. The students enrolled here come from the fifty states of America and from more than one hundred nations from around the world. The university offers master courses in different areas like arts, mass communication, music, and natural science. There are also PhD courses offered in different branches of engineering, mathematics, humanities, fine arts, law, religious studies, and health sector management. University of Arizona photograph by JR P.
The west campus of the university offers mainly education courses and MSW courses while the polytechnic campus offers education, PhD in business administration, applied biological sciences, agribusiness, and computing studies. The downtown phoenix campus offers courses in health care innovation, nursing science, public administration and public policy. When joining the University of Arizona, the student is offered financial aid support through various means with special expertise in areas of teaching and research assistance. Students registered with ASU can receive care with no requirement of health insurance. There are some minimal charges to be paid, depending on the services required. The health insurance offered by the university also covers spouses and dependants. The University offers professional development courses so that you can enhance your professional front which is very important characteristic sought in today’s competitive world. The university provides interdisciplinary communication amongst graduate students through their Graduate and Professional Student Association. The institution not only places emphasis on studies, but also on the recreational needs of its students. You can take place in aquatic classes including swimming lessons, CPR/AED for rescue, first aid, life guard instruction and as a water safety instructor. There are also weekly classes conducted in yoga. There are also three aerobic gyms with body bars, exercise balls, hand weights, jump ropes, boxing gloves, and mini-hurdles: State College Ranking. The accommodation facilities in the University of Arizona, Tucson, AZ are very good, they keep you comfortable, and give a feeling that you are in a home away from home. So on looking at the overall functioning of the University of Arizona, it can well be said that this is a university worth pursuing your studies in. Requirements for SATs (25th-75th percentile) are Math 490 – 620, and Reading 480 – 610. As it is one of the Public Ivies, the education offered is similar to found at places like Indiana University, Bloomington, University of Iowa, University of Georgia, and University of Connecticut. 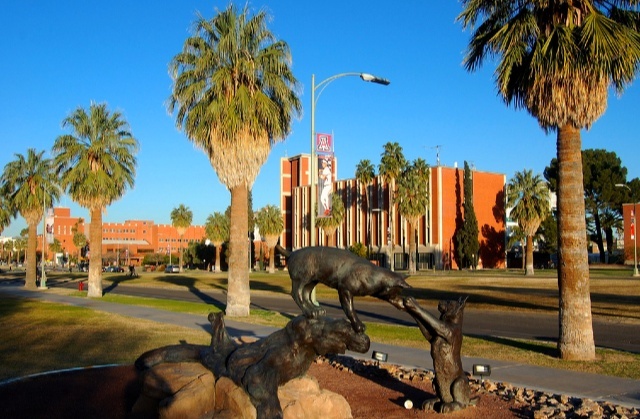 Other universities in the state include Arizona State University, and Northern Arizona University. The university is ranked as the 97th best in the world by the THE.